There is opportunity in the automotive market—that’s the tune sung to me over and over as I speak to North American suppliers, and I heard it once again when speaking to Robert Harant, program and engineering manager at Ultramet Industries. The firm operates 110- to 600-ton stamping presses out of a 40,000-sq.-ft. plant in Breslau, Ontario, Canada. Most of the work produced by its 35 employees (26 in the pressroom) supports Tier One automotive customers by providing seating, powertrain and frame components. Linear Transfer Automation added a three-axis servo-transfer system to a refurbished 600-ton press to enable Ultramet to enter the transfer-stamping market. 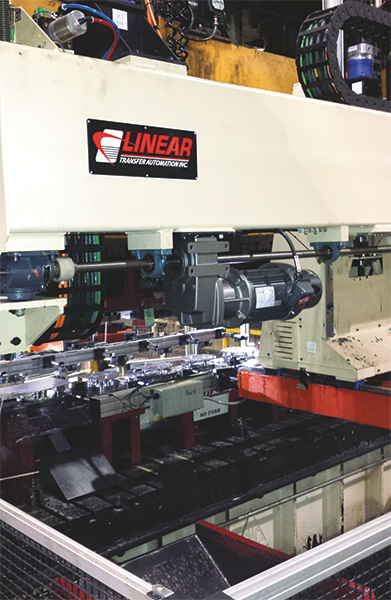 To enable die changes via forklift and permit stamping with progressive dies, Linear Transfer included an auxiliary 80-in. lift axis that enables the entire system to lift up and out of the . Responding to the market’s call for transfer-stamping capacity, Ultramet immediately embarked on a project to overhaul a 600-ton Verson mechanical press (156- by 62-in. bed size) and mate it with a front-and-rear-mounted transfer system. After installing the transfer press late in 2012, Ultramet had its capacity filled within a few months when it took on a set of 10 dies used to stamp transmission flexplate cans. As a result of the immediate success of its initial foray into transfer stamping, Harant says that Ultramet management is considering adding an 800-ton transfer press in the not-too-distant future. The newly rebuilt transfer press joins an array of progressive-die presses in the Ultramet pressroom—one 600-ton press, two 500-ton presses, and 400-, 200- and 110-ton presses. 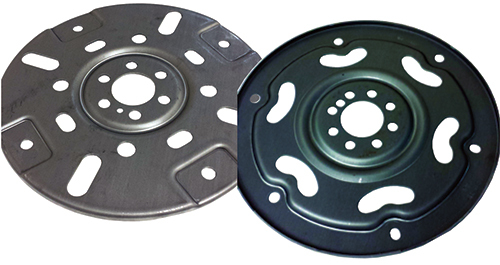 Why the preference for transfer stamping for the flexplates? Harant explains. Ultramet stamps 10 different sizes and styles of flexplates, from SAE J2340 steel 2.5 to 3.0 mm thick. Annual volumes range from 15,000 to 750,000, filled on weekly orders to 13-week forecasts. “We maintain a week’s worth of inventory, as many as 4000 stampings, for each part number,” adds Harant. A series of eight die stations cut blanks from coil stock, trim, form, pierce and restrike. We saw dimensional specs for one of the part numbers calling for an outside diameter of 281.9 mm (before nitriding), with tolerances of +0.1 mm and -0.2 mm. Formed skirt length is 4.16 mm ±0.4 mm. A series of 10 punched holes measure 10.5-mm dia. ±0.1 mm. The press runs at 20 strokes/min. Stamped flexplates ship out for nitriding, then head directly to the customer. …on the 600-ton Verson comes from Linear Transfer Automation Inc. It’s fully servo controlled and stores as many as 128 recipes. Feed stroke measures 48 in., with an 18-in. clamp stroke per side and 15 in. of lift, all freely programmable. Maximum payload (parts and tooling): 300 lb. Here are two of the 10 different styles of transmission flexplates stamped on Ultramet’s transfer press. Tolerances are extremely tight, particularly for runout and offset. “It’s the only new piece of equipment in the entire line,” says Harant of the transfer system, noting that the refurbished press has a new clutch and brake, new plumbing and a freshly remachined bolster and refurbished ram motor. The used servo-controlled coil line he added to the press line handles coils to 72-in. dia. to 40,000 lb. To enable die changes via forklift, Linear Transfer included an auxiliary 80-in. lift axis with the transfer system, which enables the entire system to lift up and out of the . And, it allows Ultramet to run progressive dies in the press in a pinch. Ultramet outfitted the dies with sensors for die protection and tonnage monitoring; transfer tooling includes part-presence sensors. A Link Systems OmniLink 5100-MPC press control oversees operations. The press operator assumes quality-control responsibilities, including piece-part inspection performed every 30 min. In addition to the previously noted dimensional tolerances, Harant adds that runout and offset tolerances are critical. Form tools are coated by Oerlikon Balzers. “We use their Alcrona Pro, Lumena and X.Cell coatings,” Harant adds. Alcrona Pro, according to Oerlikon literature, is a “top-tier” AlCrN coating for punching and forming applications, and boasts a microhardness of 3200HV and a friction coefficient (dry) of 035. For extra hardness requirements, the Lumena TiAlN coating gets the call, rated to 3400 HV microhardness. X.Cell is at the lower end of the microhardness scale (2100 HV) with a friction coefficient of 0.5. • “As yield stress increases, the amount of elastic stresses in the atomic structure increases as the sheetmetal forms. This in turn increases the amount of springback, which is the release of the elastic stresses back to their natural position. The amount of springback is proportional to the yield strength (stress). Therefore, the 550XF steel will exhibit about 60-percent more springback in bend angle, sidewall curl, twist, global shape change, etc. Increased springback correction or compensation can be difficult to achieve. • “Higher strength steel will require stronger tooling to resist deflection, wear, etc. Increased tooling downtime could occur. • “Energy required to form the steel is the area under the true stress-strain curves. Higher-strength steel will require more energy to form the same amount of deformation. The press might be capable of withstanding the load but not the need for more energy. • “The increased energy to form the stamping will raise the temperature of the material—not uniformly but a function of the amount of strain at each location. Temperature variation in the stamping can change the viscosity of the lubricant and coefficient of friction. Amounts of deformation (especially stretch) can change in different areas of the stamping to change springback and even cause galling and scoring. • “Workhardening capability (n-value) decreases with increase in yield strength. The n-value decrease with increasing yield stress can be shown on a curve. Higher strength means less allowable stretchability, as shown by the reduction in the height of the forming-limit curve.